“The world we live in is changing at a faster pace and the changes about today and tomorrow depend on the criterion application and distribution of knowledge. Information and Communication Technology (ICT) in teaching and learning are paramount in taking the society to a technological world. 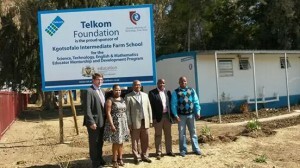 We, at Telkom, are committed in sustainable education,” these were the words of Mr Nathi Kunene, Acting Head for Telkom Foundation during handover ceremony at Tierpoort (Motheo District) when MEC for Education Tate Makgoe, Prof. Henk de Jager, Deputy Vice-Chancellor: Academic and Research of Central University of Technology, Free State (CUT); and Mr Nathi Kunene handed over equipment, including laptops, mobile libraries and mobile science libraries to four Mangaung schools. The CUT is responsible for providing the in-house facilities for the educator workshops and training, information technology training and administrative support. The handover function was part of Educator Mentorship and Development Programme (EMDP), an initiative that aims to support government in delivering quality education in Maths and Science at foundation and intermediate levels. MEC Makgoe said that these schools must ensure learners master Mathematics and English. “Our current education system requires pathfinders and brave initiators to drive education to the sky-high levels,” he said. Since 2011, the foundation has collaborated with CUT in the Free State to develop and implement the EMDP programme. Seven schools are currently involved, with retired teachers offering mentoring to educators. Telkom Foundation has invested approximately R5 million in the EMDP (R4 445 800 augmented by another R394 578.09) to support this programme for 2014 and 2015. While the project is targeted for primary school with the aim of developing, empowering, and mentoring educators in Science, Technology; English and Maths, (STEM) in the region, it is also intended to stimulate the interest of learners in subjects and careers within the fields of Information, Communication, and Technology (ICT). “We are thankful to Telkom Foundation for allowing schools to take a step further into the world of technology as part of teaching and learning in schools. Because of this initiative, these schools were introduced to the world of information technology as part of their curriculum never seen in the history of education in our province. I wish to encourage our principals to ensure that their teachers and even learners reach out to neighbouring schools and share with them the skills, knowledge, expertise and successes attained through this intervention,” stated Prof. de Jager.